The wallpaper for this cover is up for Patrons, and the new tutorial should be up shortly (I’ll update the link here and post to Twitter when it’s available), with more to come soon after. Reminder: the comic is on a strict 3x+ update per week schedule from now until the end of the series, so check back frequently~ If you’d rather have simple update notifications emailed to you, we got dat too. See you with page 1 on Weds, and Happy New Year! And thank you for the new page! Hope you’ll win some other prizes and acknowledgements for your amazing works in 2018. So excited for the conclusion of this brilliant comic! Keep rockin it Der-Shing! Happy New Year! Is the The Dig vibe I’m getting from this cover conscious or subconscious on your part? Or just imagined on mine? imagined. I’d never heard of that until it was mentioned in the comments last time, have not played it, and it’ll be a cold day in hell before I reference a video game in my work. That goes for references in general or just for videogames? How comes? I don’t like media that involves a team to make (most video games, films, etc). Also I intentionally stayed away from all modern Martian sci-fi/ media for the last 5 years in order to ensure that my work is coming from me and not deriving from another derivative… the most recent direct inspo in the story is from the 40’s. I get kneejerk annoyed at comparisons since the whole point of me doing a work like this is to create something that is new/ distilled from internal thoughts, not external entertainment. It’s distressing that someone read the comic for years but could still think I’m that lazy. Also I intentionally stayed away from all modern Martian sci-fi/ media for the last 5 years in order to ensure that my work is coming from me and not deriving from another derivative… the most recent direct inspo in the story is from the 40’s. Leigh Brackett? Stanley G. Weinbaum? 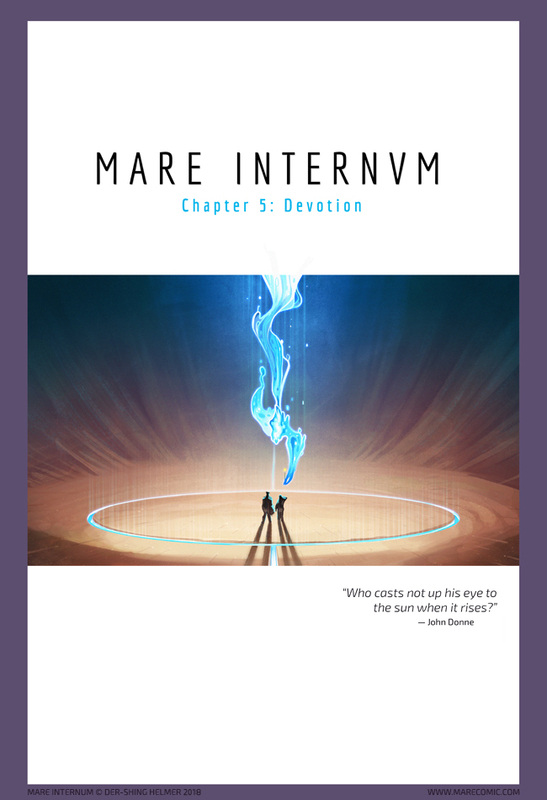 When you’ve finished Mare Internum, you might enjoy S.M. Stirling’s In the Courts of the Crimson Kings. Out of curiosity, why the dislike for media from team projects? How do you feel about film? I would suggest that it’s not as black and white as you think. It’s possible to do something for a profit and still have artistic merit. In music, people often question whether an artist or group has “sold out”, but it’s a really hard question to answer- you have to sell your work in order to live. In film, there are a lot of cases where a big-name star will sign on to a project, not because of the money, but because they believe in the work. Of course, they still make heaps of money, but if they’ve been a celebrity long enough, they don’t really need the money. Speaking of good sci-fi films, Moon is excellent. I don’t like doing it. I intentionally didn’t sell anything for years because I hate selling things. I do it now out of necessity, not because I want to. I am not profit driven except as a metric of readership. I’m mentally like 2 steps away from moving to the woods and living off the land while completing my manifesto tbh, if my family didn’t actively need me around I probably would be some principled skeleton in a cave somewhere already. Also, it’s impossible to create art without being influenced by *something*. I’m sure if you look hard enough, you’ll find influences / inspirations in your own work. From my point of view, though, the stories seem very unique, which is why I like reading them. Well, yeah obviously. I’m alive, so everything is an influence. But homogeneity comes from everyone using the same sources (“the pixar story equation!” “how to character design like xyz!” etc) as reference, so I am doing my utmost to avoid that as I get older. There’s a thought I have about being bored as an adult (vs being a kid), which is that as a kid, novel experiences are everywhere and the world seems very fresh and exciting. As an adult you’re trapped by various patterns and things become more predictable. I hate feeling fated to a life of repetition… writing things that are new to me will hopefully make my readers feel excited too. Sorry, I’d never imply with calling out a (possible) reference to another work, an act of laziness. :/ (Also, maybe worth mentioning that I thought it was an artistic call-out, not plot similarity). I am sure no one will ever think you are lazy! Two webcomics at the same time of such amazing quality! I know that an insane amount of labor goes into this stuff and I think more and more people are learning to appreciate that through the accessibility given to us through the internet. 3x weekly update… thank you based shing, you’re making my 2018. composition of this cover is so dam good too. Now that you compared the processor with god i cant help but see the burning thorn bush moses encountered on this cover. The Processor is handing her a balloon! Perhaps that is all she needed to be happy. Short-skulled, long-haired, blue flame Kalla? Oh, that cover is gorgeous… plus the quote… my first day of 2018 is off to a good start. Ditto the comments by flash ad Kyle: so excited for the rest of the story, and 3x+ updates? Der-Shing, you are too good to us! Happy New Year! The shape of this is incredibly similar to how Kalla looked when swimming down to help Mike in the mirror. I am both sad that there is only one more chapter remaining and excited to see how it all ends. Yay! Ooh, the flame of creation and rebirth! But of whose devotion do we speak? Also, I just want to say, escaping a husband who may or may not be controlling (the evidence leans towards mildly, at least unrealistic expectations), etc. is potential justification for divorce, not abandoning your children. Would those of you who support Beck in her position have been ok with her husband abandoning her and her children, and say that she had unrealistic expectations of him? I’d agree the evidence leans towards mildly controlling unrealistic expectations. That’d be potential ground for divorce for male Beck, not child abandonment! We’ll be finishing the arc about Bex in this chapter, but interesting perspective with a few assumptions that aren’t necessarily correct. Looking forward to seeing what you think in a dozen or two more pages. Despite the frenetic energy in the blue watery Kalla-shape, the white space framing it makes it feel almost restful. I saw you did the same thing with the printed version of The Meek, only vertically. Looks lovely. If there is one yes and one no you may wish to exame whether you’re a sexist of either sort. Two yeses for valueing your independence/individuality over lives you’ve created. Two nos for valueing lives you’ve created over your independence/individuality. Are you sure she wanted to escape? I thought that maybe being a settler on Mars was her dream, the culmination of her career. If it was, then she shouldn’t have had kids. Or at least applied for a temporary contract rather than a permanent one. Or waited until her kids were college aged. Unless she was or would be an abusive parent (no real evidence of that either though). In that case, I can state from personal experience that, yeah, sooner is better than later. In the earlier chapters we see that Bex is kind of reluctant to become a parent, to the point of feeling as though she may lose her individuality in a way she may not be able to tolerate. At that pivotal point in her life, her husband seemed more annoyed about her difficulty to deal with this issue than concerned and supportive. That’s the way I read it, anyway. In any case, it’s more than mild discontent she’s escaping, so to my mind, I don’t think we can outright condemn her. Looks like a “minor” morph female Wollaria? Oh, anticipation! Hey the wolleria shape is handing her a balloon. Maybe it wants to give her a wolleria friend like mike had to make her happy? Great cover page shing! I have been reading for six months and im glad i found this real gem. Eh, I’ll just assume it’s a magic wand. No one can really say how big or small those are. Haha, I agree. A Wolleria wand that makes its wearer a Martian. Forgot about this comic for a few months. I come back to John frickin Donne. Pardon while I go cry.